Hello Gudetama! OW&E’s Excellent Adventure with the Lazy Egg | Owen, Wickersham & Erickson, P.C. Back in 1977, Sanrio Co., Ltd., a Japanese stationery and gifts company relatively unknown outside of Asia, engaged Owen, Wickersham & Erickson to protect its intellectual property in the U.S. Sanrio was introduced to OW&E by a mutual acquaintance, Snoopy, whom OW&E’s senior counsel, Mel Owen, also represented. Indeed, one of Mel’s favorite stories involves an infringement claim made by Boy Scouts of America against Snoopy in his “scout” outfit, which Mel skillfully deflected by respectfully pointing out that the Boy Scouts could not own a monopoly on the concepts or scouting or uniforms. The Boy Scouts responded “Good grief! We think you’re right!” But that’s another story . . . In 1977, Sanrio had recently introduced several new characters for its line of children’s products and gifts in Japan. You will recognize at least one of them: Hello Kitty. The others were My Melody, Little Twin Stars, Patty & Jimmy, Robby Rabbit, Meadow Sweet, and Floral Poem. These characters were coming to America, and needed U.S. copyright and trademark registrations. Fast forward four decades, and you’d be hard pressed to find an American who hasn’t heard of Sanrio’s now famous Hello Kitty. She has become one of the most popular and beloved characters in the world. Currently over 50,000 Hello Kitty products are sold in over 60 countries. In 2014, we joined over 25,000 fans to celebrate her 40th birthday at the Hello Kitty Con in Los Angeles. Several other original Sanrio characters also remain popular, notably My Melody and Little Twin Stars, along with many more who have joined the ranks over the years. If you have children, you’re probably also familiar with Chococat, Keroppi, and Badtz-Maru. But now, a newcomer is fast approaching the popularity of many of Sanrio’s beloved characters. Gudetama (pronounced “goo-deh-tama” and meaning “lazy egg”), born in 2013, is a very cute egg yolk, with a very new personality. Basically, Gudetama embodies pure ennui – she or he (being an unfertilized egg, says Sanrio, Gudetama has no gender) doesn’t want to do anything. 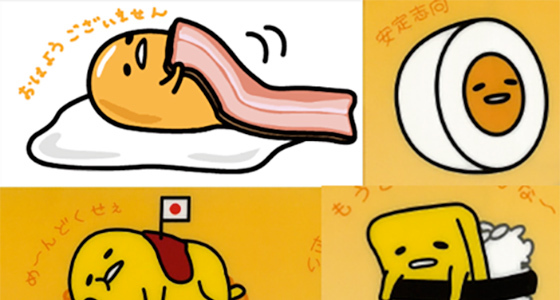 Gudetama just likes to lay around, sleep under a bacon blanket, and occasionally complain. This slacker attitude resonates with Japan’s yutori – passive millennials who have trouble communicating, and their datsuyoku – listless and relaxed –attitude. Gudetama is the star of televised animations, which depict the egg character in traditional Japanese egg dishes, including in hardboiled, omelet and custard forms, and is featured as corresponding actual menu items Japanese eateries. Popular items include Gudetama buns with custard and chocolate fillings, which pour out of Gudetama’s mouth and rear end, respectively, when the bun is squeezed. As Sanrio’s intellectual property counsel over the years, OW&E has previewed dozens of proposed new characters. We screen possible character names for trademark issues, and advise on whether particular aspects of a character’s design might not translate well into U.S. culture. When we first saw Gudetama, I admit we were perplexed, and a bit skeptical. We didn’t think Americans would react well to a character that’s a food, with explicit references to people eating the character. But we were wrong. Gudetama has become a big hit in the U.S. The Wall Street Journal recently reported that the character is continuing to gain popularity, especially among young people. Thousands of products depicting the character in its original fried egg form as well as other egg-based foods are sold here every month. Gudetama has over 120,000 English-speaking facebook fans and over 600,000 followers on Twitter – more than Hello Kitty – where Gudetama tweets mainly about doing nothing. 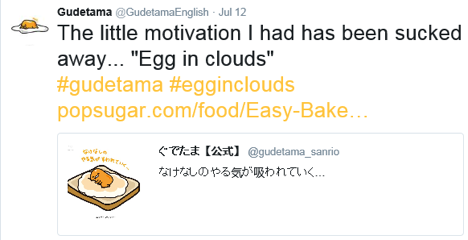 Retweet by Gudetama fan on unofficial Twitter site. Another way to measure Gudetama’s popularity is how often the new character is infringed. As Sanrio’s intellectual property counsel, OW&E polices unauthorized copies of Sanrio’s character artwork, including online. We have noticed a marked increase in Gudetama infringements. Indeed, our policing efforts re Gudetama infringements are approaching the same volume as for Hello Kitty infringements. Will Gudetama have a 40th Anniversary party in 2053? Perhaps. We’ll have to wait and see. Meanwhile, OW&E is enjoying our new adventures with the Lazy Egg. 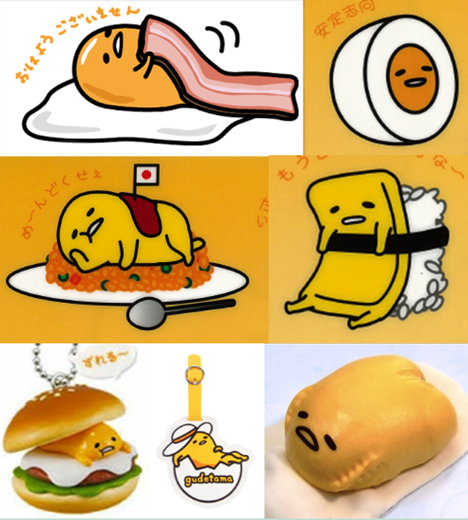 All images of GUDETAMA ©2013, 2016 Sanrio Co., Ltd.